The Metropolitan Cooking & Entertaining Show was in full swing this weekend, and I decided to take the staff at The Kitchen Studio down for a fun day of tasting and perusing new food products. For those of you who have never heard of this event, held at the Washington Convention Center in DC, it is billed as a food extravaganza. It's held over the weekend (Sat. & Sun.) 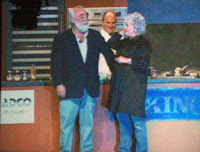 and this year featured Food Network's Queen of all things Southern, Ms. Paula Deen making 3 special appearances (tickets were $55 per person). Last year, the show's inaugural, Ms. Deen's sons were featured speakers (and for no additional charge). Now as charming as those Deen boys seem on tv, I have no problem with the ticket price for their mom and not so much for them. After all, she's a bonafide **STAR** and has worked hard to pave the road for them. I should have known that this might cause a little problem when I checked the web site before we left Frederick and saw that all of the tickets for Ms. Deen's appearances were sold out. Hmmm. They probably sold a lot of tickets, but I was sure that everything would run as smoothly as it had the previous year. After all, now they had some experience and most likely a crew ready to handle anything. Unfortunately, that wasn't so much the case. Don't get me wrong. We didn't run across a jerk the entire time, but what we did run across were were folks who didn't know what anyone was doing. The line to get in was atrocious -- many hundreds of people long. I had purchased tickets online in advance just for general admission ($20 each plus a weird $2 fee -- just tell me the tickets are $22, don't tack on some "processing fee" when I'm buying them directly from you please!). Once we came down the elevator, we were pushed toward folks with scanners then told to get in line. This was a bit of a bummer because I wanted the TKS staff to feel relaxed and have a good time. Waiting in line for 45 minutes doesn't really help that feeling too much, especially since we were there for general admission. The clock ticked on and more than a few women in line were starting to get frustrated. Most of the people in line were there to see Ms. Deen; scheduled to go on at 11. At 5 'til, several hundred were still in line. One of my employees even heard a member of the convention center staff tell one poor woman that she wouldn't make it in time and there was nothing he could do. I felt really sorry for her, having spent $75 just to get into the show. Luckily, Ms. Deen held off until 11:30 so that everyone could be seated. You should have heard the roar of the crowd when she made her entrance. They were thrilled! After speaking to a few folks from the sponsor (The Tiny Kitchen - http://www.thetinykitchen.com/) , they tried to shift blame to the convention center folks, which I suppose I could understand. There was no clear signage, though the gentleman I spoke with said that NO ONE ever reads signs (sounds just like a guy -- girls read signs!!). I'm hoping that next year, they'll be better prepared, as there must have been 750-1,000 people there just to see Ms. Deen. Onto bigger and better things -- we had a GREAT time. The group split off and everyone had more than her fair share of tastes and treats. Blue Moon Chocolates (available at Bones & Cones in Hagerstown) are AMAZING! 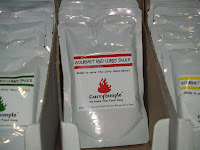 I also picked up this delicious red curry sauce - sooo yummy. I'm thinking sauteed shrimp with some un-offensive veggie and some basmati rice. Woo hoo! While I was going hog-wild, I also picked up some Red Rocker almond toffee with dark chocolate. You can tell there's real butter in there ba-by! There were workshops (small, personal, & no additional charge!) and "interactive cooking demonstrations". I attended one of these last year and had the BEST time. This year the price was raised quite a bit (from $80 to $125), but the layout looked much better and less crowded. Aprons were draped across each chair and I'm sure everyone took home lots of goodies, just like in 2006 (I still have my Spode turkey tureen).